Oatmeal cookies might seem “plain”, but when made with melted butter, as opposed to creamed, they take on a divine chewy texture. Taking the extra step of browning the butter brings them up to a higher level – sophisticated, a tad nutty in flavor and completely different than the run-in-the-mill oatmeal cookie. As an added bonus, they are whipped up by hand very easily. The cookies are fabulous enough to stand on their own but this dessert uses them to create an ice cream sandwich. Purchased vanilla ice cream is folded together with deep purple, juicy, syrupy, caramelized blueberries. These can be made ahead and stored in the freezer for up to 3 days, after which the brightness of the fruit declines. For the Cookies: Position rack in middle of oven. Preheat oven to 350 degrees F. Line two jellyroll pans with parchment. In a small saucepan melt butter over medium heat. Once melted, continue to simmer over low-medium heat for 3 to 5 minutes or until the liquid turns a deep, rich golden color. The milk solids, which sink to the bottom, will turn very dark brown; do not overcook and allow the mixture to burn. Any foam on the surface should be skimmed away. Pour browned butter in a large bowl, leaving the milk solids behind. Whisk in the brown sugar and sugar until combined. Allow to cool briefly, then whisk in the egg and vanilla. In a separate bowl, whisk together the oats, flour, baking soda, cinnamon and salt. Add dry mixture to wet ingredients and stir until just combined. Place scant 2 tablespoon sized scoops of cookie batter on pans placing them 2-inches apart (just make sure you have 16 equal sized cookies). Do not flatten. Bake for about 10 to 14 minutes or until the cookies are a light golden brown around the edges, but still a little soft, but not wet, in the center. Cool pan on rack for 5 minutes then remove cookies to a cooling rack and cool completely. Store in an airtight container at room temperature up to 1 day ahead. For the Filling: Spread the blueberries in a single layer in a nonstick skillet. Sprinkle with sugar and water. Stir to coat. Heat over medium heat until sugar begins to dissolve, then mash with a potato masher. Bring to a simmer and continue to cook for about 4 minutes, stirring occasionally, until the juices have begun to reduce and thicken. The mixture should be a deep, dark purple with a syrupy consistency. It should be thick enough so that when you draw a spoon along the bottom you can see the pan for a few moments. Remove from heat and cool completely. Remove ice cream from freezer and allow to sit at room temperature for about 5 to 10 minutes, or until softened, but not melted. Fold in the cooled blueberry mixture until it is a uniform color. If you have the time, it is best to chill ice cream at this point until it is solid again. Filling can be made a day ahead and frozen overnight in an airtight container. For the Assembly: Have a tray in the freezer that will fit all of the ice cream sandwiches. Remove ice cream from freezer and let soften at room temperature for a few minutes. 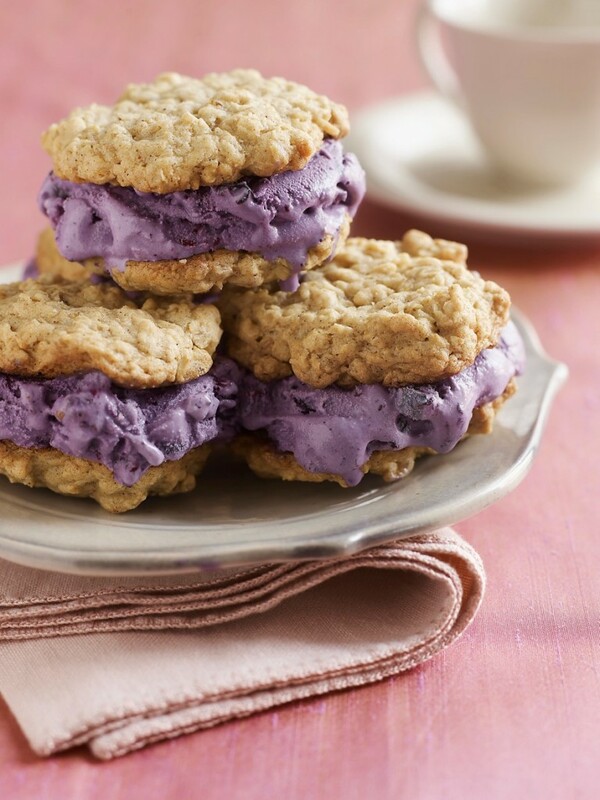 Place a generous 2 tablespoon sized scoop of ice cream on a bottom half of a cookie and top with another cookie, bottom side against ice cream. Squeeze gently so that ice cream presses out to fill entire cookie surface. Immediately place on tray in freezer. Repeat with remaining cookies and freeze them until solid. Place sandwiches in a zippered top plastic bag and place back in freezer until needed. Remove sandwiches from freezer about 5 minutes before serving. Sandwiches may be frozen in airtight container for up to 3 days. Tip: Take care when browning the butter; you do want it browned, but not burnt. The dark brown sugar, as opposed to light brown, accentuates the deep, rich flavors from the browned butter and the caramelization of the berries. The choice of oats is very important as well. Old-fashioned rolled oats give the right chewy texture. The ice cream filling will only be as good as the ice cream used; search out a premium brand. My favorite vanilla is Haagen Daz. These can be made ahead, but any dessert can take on an “old freezer” flavor and suffer a loss in texture if stored too long. It is best to eat these within 3 days.